I love a diary. I'm just reading the second volume of James Lees-Milne's. I'm not greatly bothered about the professional world he operated in - he was one of the prime movers behind the National Trust - but I find his dogged old-fashionedness cracking fun. Even in the 1970s he's still using the words "motor" and "lunch" as verbs. He talks about the ringing of the "telephone bell" and describes his struggles with a "self-photographic box" at the Passport Office. His concerns are refreshingly out of sync with his age, let alone ours. He describes, in painful detail, a dinner with Princess Margaret's circle and lists everyone at the table with the exception of one woman he describes only as "a film star". That's what today they would call "cool". 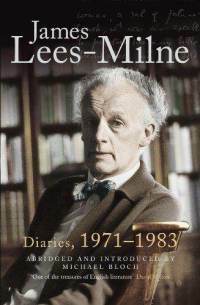 One of the famous stately homos of old England, Lees-Milne and his old pal, the no-less married John Betjeman, get together in old age and chuckle over who used to "tuck up" with whom back at Oxford. I wonder if publishers are going to fight shy of paras like this in the post-Savile era: "
Walking to church he said, I wonder what the bell-ringer will look like. I said boy bell-ringers should be plain, spotty and wear spectacles. Yes, he said, men don't make passes at boys wearing glasses. We were mistaken, our bell-ringer was a very pretty boy with a cream complexion.....At Westonbirt, where I took him during the afternoon, he was sent into ecstasies by a girl with flaming red hair and blue jeans who was lolling lasciviously over a table in the library. These thrills and what he calls "letchings" are sheer fantasy, I presume. Amazing! Serious journalists can use the word 'homo' in England? Couldn't happen here, even with obvious affection to the subject. One more thing to love about that 'sceptered isle'. I think that bullying and buggering were par for the course for those of JLM's and Betjeman's class and era; all those prep and public schools rammed with ignorant and pubescent boys. On the Saville line. There is an episode of The Sweeney in which, while Carter was sat in a car on a stake-out, a school girl in uniform cycles past. ''Phwooor! There's summat abaat those school uniforms aint there.'' Says George launching himself from his seat. Whether Carter was a paedo or not we will never know but we can be sure that there isn't a producer in the land that would let that line pass these days. But more out of fear than because they thought it was a wholly unrealistic reflection of the male psyche. Are we naive enough to think that human nature has completely changed since the 70s, when paedophiles openly roamed the land and No Child Was Safe? If anything, the sexualisation of children and young girls in particular has roared on apace since then.